I like quilt challenges, but almost never take the time to participate anymore. I am almost always in the middle of an important piece of my own and don’t want to disrupt my flow. I also have a long list of dream projects. However, occasionally, I will take part in a challenge. I did the A-B-C quilt as part of a challenge and the Whole Cloth Quilt as well. I am very pleased with both of them. I saw the challenge exhibit at PIQF last year and that exhibit made me buy this book. I thought the outcomes were really interesting and beautiful. 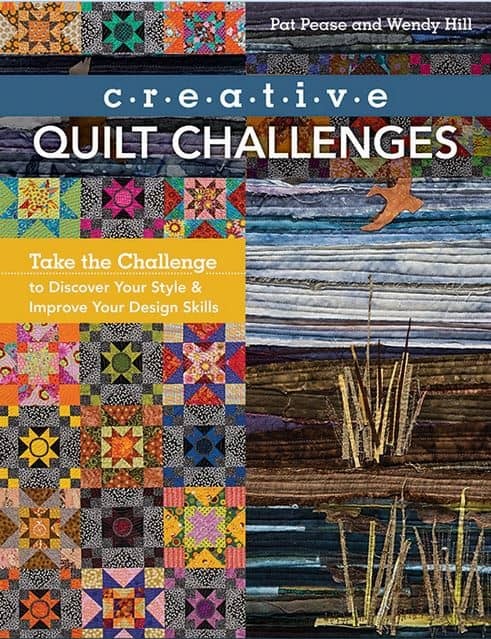 The Table of Contents is full of detail information on the quilts made and the tips and techniques demonstrated (pg.3). The introduction includes a line that I use often to explain my fabric purchases. “When we look through our fabrics at home or go fabric shopping, we don’t see yards of whole cloth. Instead, we imagine finished quilts (pg.4). This is absolutely true for me and when I read that I decided I like these authors. They followed it up with “when we go about our day, we don’t only see the world around us – we see potential pattern, colors and ideas for future quilts (pg.4). If you follow my Instagram feed you will see what I post and will know that I am always looking at the world around me in hopes of being inspired for my next quilt idea. The first paragraph of the Introduction (pg.4) could have been written by me. The rest of the Introduction explains how the book came about, how the authors differ in their work style. They characterize this book as an invitation to “enter the ‘Land of Color, Design and Imagination’ ” (pg.4). They make it clear they want you to explore, but aren’t giving the reader a map. They are also clear that they want you to use their challenge themes. Why buy the book, otherwise? LOL! 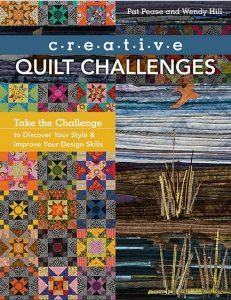 The authors acknowledge that there are many ideas for quilt challenges on the Internet. They “selected the ones you see in this book because we found them appealing, inspiring and focused enough to have cohesion but open-ended enough to allow us to run with the idea” (pg.5). They also sketch out basically how a challenge works (pg.5). Then they dive right into the challenges and the quilts. Each section talks about the parameters of the challenge or includes a brief description or inspiration. Next they talk about making the challenge personal (pg.6). I think the latter is a very important aspect to this book. This is what will help readers grow. Books that tell the maker what to do step by step with no space for improvisation add to the store of quilts, but not to growth as a quiltmaker. In the first challenge they answer the question “what did we learn” with “Exploring the anatomy of a familiar block allows you to go in new direction while being grounded in a foundation that you already understand. Starting with something you understand frees you up to try new things without getting overwhelmed” (pg.6). I liked the skillbuilding included in each challenge. As I have made clear, learning new skills contributes to growth as a quiltmaker. The first challenge includes a visual tutorial on partial seams (pg.9). Partial seams* aren’t often taught, even in sampler classes, but they are very useful skill for modern design as they facilitate the ability to sew asymmetrical designs together. While this book is published by C&T and it makes financial sense for them to promote some of their other products, their inclusion of the Ultimate 3-in-1 Color Tool by Joen Wolfrom is not gratuitous. This tool, along with the Studio Color Wheel and the Design Ratio Tool are three of the best color and design tools I own. As the authors say the 3-in-1 Color Tool helps to “visualize color progression, such as chartreuse going to yellow-green, then to spring green” (pg.11). I find both color tools help me find what color is missing in a quilt and give me ideas for color combinations. The second challenge (pg.18-27) is about value. I know value is an important aspect of color work, but I don’t like the idea that it is more important than any other aspect of color work. This book has the right attitude for me. The authors express this sentiment well when they write “color is a visual language that goes hand in hand with value, the relative lightness or darkness of a color” (pg.18). The authors include technique demonstrations or lessons in each section. These demonstrations show how to make units or parts that make up their quilts. The technique in Wendy’s quilt is the Reversible Double French Fold Binding (pg.24). I am always interested in learning new ways of binding, especially when one works on reversible quilts. The other challenges are interesting and useful as well. Unlikely Materials (pg.28-39) gives permission to move beyond ‘regular’ quilt fabric. A maker could use decorator fabrics to introduce texture into their work. FabMo fabrics would work very well. “The Collection’s” (pg.50-59) intent is to provide an opportunity to use a favorite group of fabric. While useful in general, the challenge is especially fun if you and a friend collect the same type of materials (fabric, embellishments, etc). There are a number of things to like about the challenges. The authors provide many step by step photographs to illustrate and help explain the various techniques. There is scope for change and evolution in all of the challenges. Also, these are all techniques and ideas rather than step-by-step projects. Your pieces will come out much differently than those the authors created from the same directions. Towards the back is a section called Special Techniques (pg.86-104). this section helps make the quilts successfully. There are two machine binding techniques (pg. 86-87) as well as a Facing Finish (pg.88-89), if you don’t like my facing tutorial. 😉 The authors show how to make inset squares (pg.92-93), which I want to try. I liked that they talked about pressing in a sensible non-dogmatic way (pg.94), though they don’t discuss the benefits of matching seams when seams are pressed to the side. The various pages on stitching techniques will help the art quilt makers among you (pg.99-104). The book includes a gallery at the back with more colorful and interesting pieces. There is no index, which is a shame because it would be really useful with all of the techniques the book includes. Making art quilts is not in fashion right now. Many of the art quilts being made are being lumped into the modern category, especially the political quilts. This book is the closest I have seen to an art quilt book recently. I like for that and also for the skill-building aspect. *Check out the tutorial on sewing partial seams.